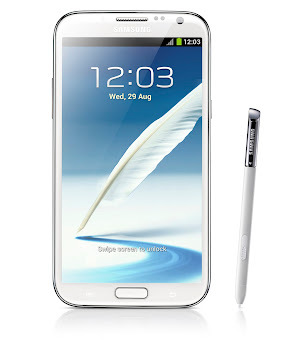 Samsung and Android fans around the world were treated today with the ultimate Android smartphone experience with the unveiling of the eagerly awaited Galaxy Note 2, the larger, more powerful upgrade of the Galaxy Note. It was at last year’s IFA that the first Note was launched by the South Korean consumer electronic giant. The initial response to the original Note was mixed by both those who first saw it, who were not comfortable with the larger than conventional size, prompting many to call it a “Phablet”, something too large to be a phone and not large enough to be a tablet. The Note, however, proved the critics wrong by going on to become a much loved device. Though not everyone took a liking to the 5.3 inch display, those who embraced it, fell in love with it. The Note 2 hopes to carry on that legacy with an even larger, 5.5 inch display. So, what are the upgrades that the Note II bring to the game? First is the new stylus or S Pen. The S Pen has been redesigned and made larger to make it more comfortable to hold, giving you the same feel as holding a regular pen. The S Pen now allows for easier and more creative ways to do things like cropping, capturing content on the screen, sketching and shading. A new feature called “Idea Visualizer” will let users add illustrations by just handwriting keywords. The S Pen has been given newer methods and abilities to interact with the phone. Such as, now just hovering the S Pen over the screen will open the email app, video, S Planner and image gallery app without the need to specifically opening them. “Popup Note” is basically like popup video, where a floating notepad appears anytime we need it to. For example, pulling out the S Pen during a call will automatically “Popup Note”. Opening frequently used applications is made easy with ”Quick Command”. Just swiping up with the S Pen will open a list of frequently used apps. Apart from these software upgrades, the Note II also possess a 1.6 GHz quad-core processor, 2GB of RAM and runs on Jelly Bean out of the box. Here is a detailed list of specifications.